It is not easy to choose a modular for a space as important as the living room. We have to think about many things, like decorating style , the budget we have, the pleasure of those living in the house… and of course the space with which we have. If you like the design minimalist , this sectional is a great option for you. 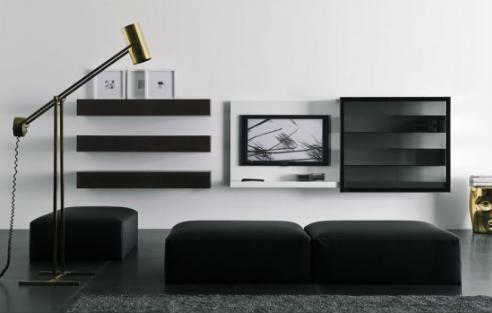 This is a proposed modular Bontempi Casa and is part of the range Voila, designed for modern, minimalist environment. It is a modular designed as a “backbone” that will give life to your living room with little space requirements. This module consists of an elongated plate is placed on the wall , and has special slots to place there shelves of various widths. This module has the advantage of being fully customizable: you can choose from several colors and also the shelves can be placed in different orders, so be changing the look of the room with just a few movements. This modular will allow you to drop from books to ornaments and TV , a fundamental piece in any room. This entry was posted in Living Room and tagged A minimalist modular, design living room, living room decor minimalist, minimalist modular living room. Bookmark the permalink.